Philip Dutton had the save of the day. Not only did he get Mighty Nice over the jump and between the flags, he even stayed on! Dutton is now in fifth place, moving up from 15th after dressage. The cross country course in Rio was long and technical with most riders reporting that it was a true 4*. Click on the image for fence by fence photos. 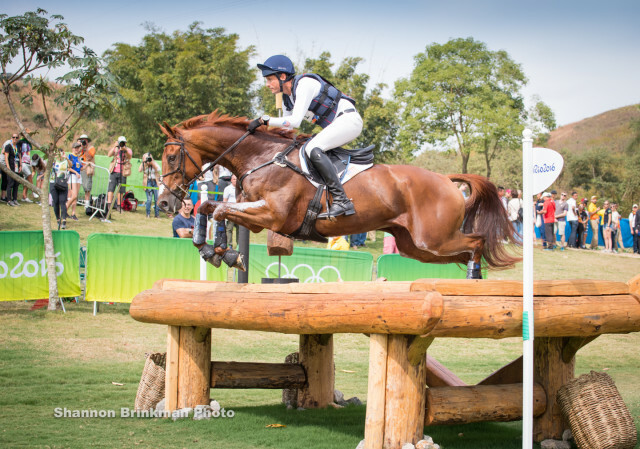 Everyone predicted that the cross country course in Rio would be hard and it lived up to their expectations. It really shook up the leaderboard with some top combinations falling out of medal contention and others moving way up in the rankings. I really wish I had access to the live stream of the cross country but unfortunately I don’t have cable and while I’ve signed up for Sling, they haven’t broadcast any equestrian events yet. It’s highly frustrating to only see still photos! About 70 percent percent of the field completed the course, with just 40 percent jumping clear, which is the lowest clear rate in the short-format era according to EquiRatings. Just three combinations made the time, and they’re all sitting in the top three after cross country. Chris Burton piloted a relatively green Santano II, who has only competed in one CCI3* prior to this, to a foot perfect round, coming home bang on the optimum time to remain on his dressage score of 36.0 and move from second up to first. Dressage leader William Fox-Pitt picked up 20 penalty points for crossing his own line when he realized that he needed to take the long way through a combination. Michael Jung is now sitting in second place and Astier and Piaf de b’Neville’s moved from 11th up to third place and Mark Todd moved from 17th to fourth. Boyd Martin and Blackfoot Mystery moved up from 35th to 6th place after cross country. Unfortunately, the US team is no longer in contention for a medal at the games. Clark Montgomery withdrew after several problems on course with Loughan Glen. And Lauren Kieffer and Veronika fell at fence 24. Right now the leading teams are Australia, New Zealand, and France followed by Germany, The Netherlands and Brazil. You didn’t want to watch anyway. It was grueling and hair-raising. This course was wicked, the poor horses had to be yanked around into tight turns and there were many refusals. I’m amazed some of the horses made it over a certain jumps, there was a lot of flinging and last minute launches. They tried hard for the riders, but this course was tricky. I had to stop watching after Lauren and Veronica fell, it looked like it was going to be bad. Veronica didn’t get up right away, and my heart stopped, but it seemed she maybe just had the wind knocked out of her and the rein caught on her leg. Both walked away looking ok. I’ve seen a lot of criticism of this course. Really glad no one got injured. Probably true. It’s no fun wondering if someone is going to get hurt. I was able to watch some of the show jumping this morning because it was on USA. That was probably nerve wracking enough. That course looked incredibly tough! The jumps themselves weren’t quite as cool looking as the London 2012 course, but it seemed much more technical!